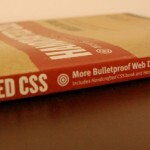 I have just finished reading Handcrafted CSS by Dan Cederholm and all I can really say is WOW! As a big fan of Mr. Cederholm’s work, I have read, re-read, and enjoyed all of his books and I had high expectations for his latest release. Of course, my expectations were blown away and once again Mr. Cederholm hasn’t let us down! "Phillip is genius at understanding my product and website needs. He created a website that is user friendly and extremely easy to update. As an artist, I appreciate the aesthetic quality and his abilities to maximize traffic are beyond genius."